You can serve the patties just as you would other breakfast sausage -- alongside eggs or pancakes, for example -- but here they star as a perfect protein for these tasty breakfast sandwiches, stacked on whole-grain English muffins with a juicy slice of tomato, some spinach leaves and slices of buttery avocado. Make Ahead: The patties can be formed and refrigerated between pieces of plastic wrap or wax paper for up to 3 days, or individually wrapped and frozen for up to 1 month; defrost in the refrigerator overnight. Whisk together the fennel seed, sage, salt, pepper, thyme, garlic powder and allspice in a small bowl. Place the turkey in a medium bowl, then sprinkle the seasoning blend evenly over it. Use your clean hands to gently work the seasonings into the meat, being careful not to over-mix; it's okay if they are not absolutely evenly distributed throughout. Form the mixture into 8 patties that are about 3 inches across. Heat half the oil in a medium nonstick skillet over medium-high heat. Once the oil shimmers, add half of the patties; cook until nicely browned on the outside and cooked through, about 3 minutes per side. Transfer to a plate; repeat with the remaining oil and patties. To make the sandwiches, toast the English muffins. Place a few spinach leaves on the bottom half of each one. 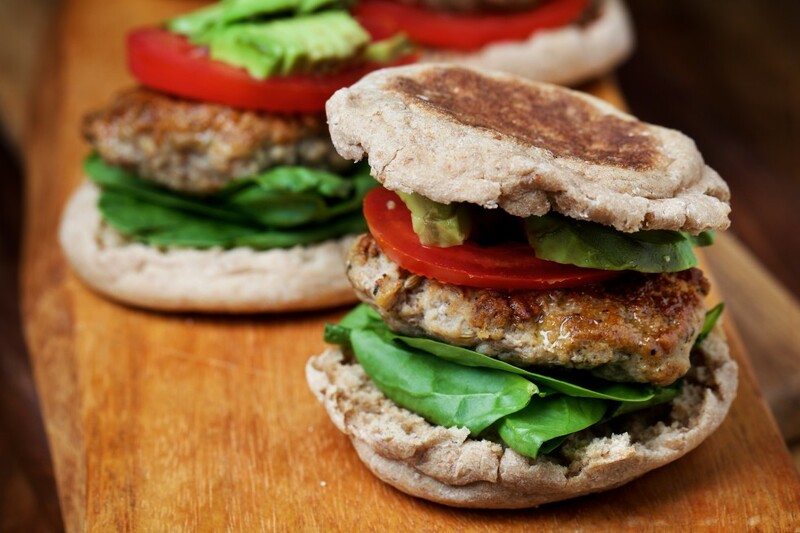 Add a cooked sausage patty, then a slice of tomato and a few slices of avocado on each portion. Add hot sauce and/or ketchup, if desired, then place the top of the muffin on the sandwich. Serve right away.